The Crown Jewels are in danger... again! When the jewels go missing from inside a locked room, Mac's spy skills are put to the test. How did the thief break in? Where did the jewels go? And will Mac be able to solve this locked room mystery before the thief escapes? This mystery isn't just a whodunit... it's a howdunit! The action in this new adventure is nonstop, as Mac travels to an ancient Irish castle to solve the mystery. There, he encounters everything from killer king cobras to bizarre ice sculptures... and even a revenge plot dating back hundreds of years! Will you be able to solve the mystery before Mac does? Also features historical facts masterfully woven throughout the plot, and full-color illustrations on every page. 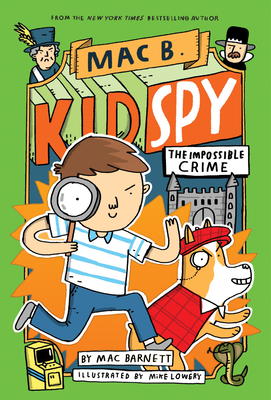 Don't miss the newest installment of this totally smart and sidesplittingly funny New York Times bestselling series, Mac B., Kid Spy. "Funny as a crumpet. (But truly, secretly a hundred times smarter.)" --Jon Scieszka, author of Caldecott Honor The Stinky Cheese Man and Other Fairly Stupid Tales and the New York Times bestselling series Frank Einstein.